Today is Free Bingo Friday at BOGOF Bingo, win real cash without spending a penny! BOGOF Bingo have made every Friday more fun by offering their players free bingo games with real cash winnings. To play free bingo at BOGOF Bingo today head over to the ‘BOGOF Heaven’ room to enjoy 2 hours of free bingo fun. The games run between 11:00am until 12:00pm and 11:00pm until 12 midnight in the BOGOF Heaven bingo room. Every second bingo game will be free and you could win a fantastic cash prize. Over the weekend the excitement continues at BOGOF Bingo with promotions running on both Saturday and Sunday. All purchased bingo tickets will allow players a chance to win some great cash prizes. The prizes start at £10 and go all the way up to £1,000. 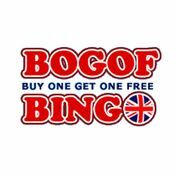 BOGOF Bingo as you would guess from the site name has loads of buy one get one free bingo games. There is 75 ball, 80 ball and 90 ball bingo available and other side games too including slots and casino games. New bingo players at BOGOF Bingo will receive £10 free play when they deposit £10 as a welcome bonus, otherwise known as a 100% deposit bonus on deposits of up to £250. BOGOF Bingo is one of the newest bingo sites around, you may have seen DJ Talent advertising the site on television and if you haven’t it’s certainly one to look out for as it’s so funny!